Click the play button to hear a short clip from Alma Brasiliera. Chopin Sonata No. 3, Op. 58 -Finale - presto. This is one of the most interesting and eclectic piano discs that I have heard for some time. 19 tracks of music, including the challenging Rudepoema by Villa-Lobos, Sergio Gallo takes us on a real voyage of discovery, lit by a keen musical imagination and amazing technique. Much of the music is lighter i.e., Nazareth, Lima, Netto and Cervantes, but it is never treated trivially and always the dance rhythms are well sprung. Somehow mixing the more salon orientated music with stronger musical fare succeeds, as a disc of sweetmeats could be too much for the palette! This is a short excerpt of a in depth article. Please click the link to access the piece in its entirety. Technically speaking the title is correct: there are more minutes of Heitor Villa-Lobos on this disc than any other composer, thanks to his Rudepoema clocking in at 20 minutes. But the Brazilian’s music really accounts for only three of 19 tracks. Better for pianist Sergio Gallo to have given this recital some independent name, lest the consumer feel a bit short-changed. Especially since the most intriguing music on this lively disc is not by Villa-Lobos but his lesser known companions. Take for instance the Tides of Manaunaun by Henry Cowell, paired with his iconoclastic Aeolian Harp – both played with vigour and integrity by Gallo. Or the vivacity of Danzas by Ignacio Cervantes, or the rarely heard waltzes that open the disc, by Ernesto Nazareth (Eponina) and Souza Lima (Maria), both lent a lovely casual, almost decadent flavour by the pianist. Indeed, Gallo’s ability to play even fast passagework, such as Camargo Guarnieri’s Toccata, Barrozo netto’s Minha Terra and some of the preludes of Robert Muczynski’s Op. 6 set, with patience and deliberation, impresses. In the latter Gallo paces the music so well, holding back slightly in the early, quicker movements so as to build to the Allegretto fourth movement, then building again to the finale. His nuanced performance, with its eye to the large-scale structure, gives the impression of a much longer piece in a work where each movement is essentially a minute long. Which brings us to the Villa-Lobos. Gallo deftly exhibits an alternately intimate and epic Impress�es seresteiras and a bright A mar� encheu, in both cases reveling in sprightly rhythms. The paean to Arthur Rubinstein, Rudepoema, seems out of place on an album of lighter works, but Gallo again takes a patient approach, allowing the portrait grow organically and climb to splendid climaxes. Questionable name and all, this is an enjoyable disc played with exceptional artistry. “Mostly Villa Lobos” and mostly delightful, this collection of modern piano music concentrates on the seductive and dreamlike aspects of this rich repertory than on the stereotypical wild stuff. Cowell’s Aeolian Harp, for example, sounds even more ghostly than usual. Villa Lobos’s ‘Impressions of a Serenade’ is like early Scriabin with Latin American colors; Nazareth’s ‘Eponina’ is like a waltz Chopin might have written had he traveled to the Americas. The gentle ambiance is reinforced by Eroica’s soft acoustic and pianist Sergio Gallo’s poetic refinement. When a bravura piece does erupt, as in ‘Rudepoema’, Villa-Lobos’s splashy love letter to Arthur Rubinstein, the effect is shocking. The title is from the Villa-Lobos Choros No. 5 and means Soul of Brazil. 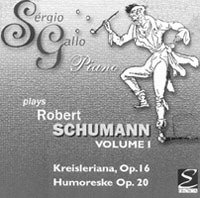 Together with its discmate, Impress�es Seresteiras, it encapsulates the spirit of its composer in a very short time span and is given a moving, if faster than usual, interpretation by Gallo. Although currently on the faculty of the Music Department at the University of North Dakota, he transcends that severe climate and offers warmth in this and all of the performances here. Chopin's Sonata No. 3 is gentler in spirit than his Second Sonata and has a lovability that Gallo realizes to the fullest. All flows evenly with no apparent effort, and the technical hurdles are never to the forefront. The two books of Brahms's Paganini Variations are hardly shrinking violets when it comes to a demand for virtuosic display. Once again Gallo heads in a new direction by getting everything correctly in place." "Scriabin Sonata No. 4 in the difficult key of F-sharp is a neurotic, tonally ambiguous work that finds Gallo in excellent form. It joins the Villa-Lobos as the best performances here. 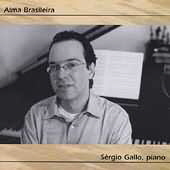 Pianist Sergio Gallo has released a marvelous new CD on the Eroica label with the title Alma Brasileira (Soul of Brazil), which is also the name of the first piece on the recording by the composer Villa-Lobos. 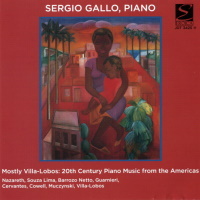 Unlike many pianists who have attempted to interpret the music of Villa-Lobos and failed, Mr. Gallo plays the two works by the Brazilian composer in splendidly executed interpretations which offer the listener a sparkling, fresh, and clear understanding of some fascinating music by this often neglected composer. Gallo's sensitive and imaginative tone-painting leaves one wishing to hear more Villa-Lobos. Next in the eclectic repertoire of this recording, Mr. Gallo plays Chopin's Sonata in B minor, Op. 58 with admirable flare, utilizing a highly artistic approach which combines a natural masculine bravura in his brilliant playing with an exquisite cantabile when the music calls for it. 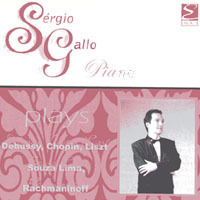 Mr. Gallo demonstrates a thorough understanding of Chopin's poetic style through his flawless technique throughout this work, and he manages this without the excessive "flash and bang" heard so often by pianists of the Russian school nowadays. Brahms at his most difficult comes next, as Mr. Gallo plays both sets of the Variations on a Theme by Paganini, Op. 35. Almost "Lisztian" in their technical demands upon the performer, these works are very untypical of Brahms' generally conservative style in his piano works. Nevertheless, Mr. Gallo takes up the gauntlet of these difficult variations and makes them sound almost effortlessly executed with his genuine artistic prowess. For those truly interested in collecting piano literature recordings of the Romantic era, the Brahms Variations alone make this CD a "must have" item for such a collection. To end the disc, Mr. Gallo selected the Scriabin Sonata No. 4 in F# Major, Op. 30, which is a transitional work between the composer's early style and his mature works. This sonata is a difficult work to interpret, due to its many harmonic and rhythmic ambiguities, but it is played thoughtfully, with a sensitive, lyrical tone in the beginning, and it ends with a robust large tone that avoids being harsh. The pianist displays considerable originality here along with a sense of adventurousness when the music exposes the composer's emerging dissonant harmonies. Overall, Sergio Gallo has succeeded with this recording in presenting both rare and familiar works of piano repertoire, played with conviction, sensitivity, and above all a genuine affection for the music. This recording is an impressive, and quite thought-provoking achievement. Sergio Gallo is a grand pianist whose every note is sincere. It is hard to imagine a pianist leaving me with a more intense feeling of nobility. This suits his interpretation of works such as Debussy's 'Collines d'Anacapri' and Joao de Souza Lima's 'Cancao Infantil' quite well. Debussy's 'L'Isle Joyeuse' is always of interest to me, since few works in the mainstream repertoire are played so differently depending on the pianist. Gallo paints a picture of an island I would love to visit - patient, unhurried, wondrous, and trouble free. ...To begin with, his Bosendorfer makes a glorious sound, and his sympathy for the music of Schumann bodes well for the continuance of his series. Both in Kreisleriana and the Humoreske he is sober and controlled at all times. If you have the technique, it is all too easy to whip up the tempo when contrasting the eight character pieces inspired by ETA Hoffmann's wild and eccentric Kreisler. Gallo keeps on his safety net and resists any temptation to overreact to the whim of the moment.